Why is this evidence so feared by the dark forces? In 1964 John Stewart Bell proved a mathematical theorem and claimed that “no physical theory which is local and realistic (in the sense espoused by Einstein) can reproduce all of the statistical predictions of quantum mechanics.” However, in a series of papers written between 2007 and 2014 I constructed just such a local and realistic framework for physics. Consequently, today Bell’s theorem no longer has the fundamental significance for physics it was thought to have. Here the complete state of the spin system is represented by the initial orientation of the 3-sphere, and the results and are limiting cases of for the rotation angles and . Note also that a 3-sphere cannot be charted by a single coordinate system, but an anholonomic frame, made up of graded basis , can be defined on it, fixing each of its points uniquely. 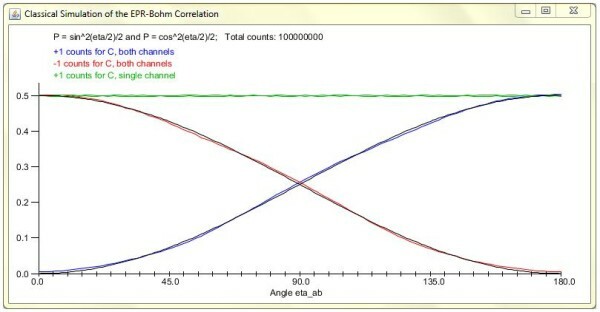 It is the impossibility of defining a global coordinate chart on but possibility of defining an anholonomic frame on it that is ultimately responsible for the existence of EPR-Bohm correlation. is relatively easy to reproduce in a strictly local and realistic manner. In fact, once the topology of the codomain of the measurement functions is correctly taken into account in the above manner, the observed EPR-Bohm correlation predicted by quantum mechanics inevitably falls out as a classical, deterministic correlation among the points of an absolutely parallelized 3-sphere. This is a robust result. It is not difficult to prove that correlation between any two points and of is necessarily equal to , with and being the limiting cases of and , respectively. Thus all the perplexity generated by Bell’s impossibility claim is much ado about nothing. It stems from a topologically incorrect accounting of measurement results. You can verify these facts in an explicit computer simulation of the model, as discussed in this paper. At least five explicit, event-by-event, numerical simulations of my local model for the EPR-Bohm correlation have been independently produced by five different authors, with codes written in Java, Python, Mathematica, Excel VB, and “R“. The above 2D-surface version of the simulation of my local model can be found here. I discuss two of these simulations in the appendix of this paper. A compact translation of one of these simulations (from Python to Mathematica) can be found here. Each simulation has given different statistical, geometrical, and topological insights into how my local-realistic framework works, and indeed how Nature herself works. 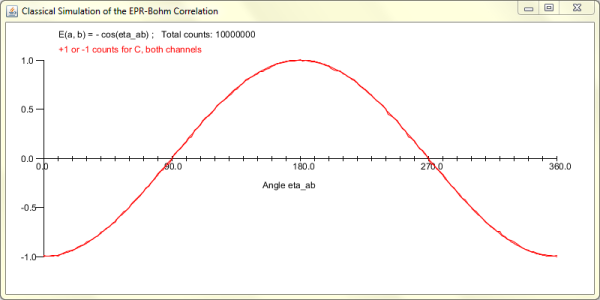 The most accurate simulation of my local model for the EPR-Bohm correlation can be found here. From the above discussion Bell’s mistake is now very clear. 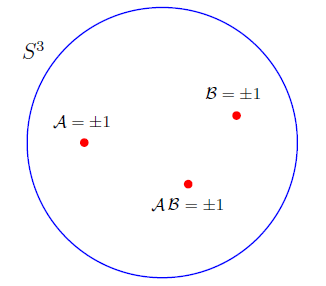 Instead of investigating correlation among the points of a parallelized 3-sphere, Bell naïvely investigated correlation among the points of a real line to prove his celebrated theorem. But even an elementary topological consideration is sufficient to recognize the fact that correlation among the points of a real line cannot possibly be the same as those among the points of any topologically nontrivial space such as a parallelized 3-sphere. This upper bound has been derived in detail in the last appendix of this paper. This derivation has also been numerically verified in a GAviewer by Fred Diether and myself. It is of course exactly what is predicted by quantum mechanics. Thus, with the topologically correct choice (1) for the measurement functions, not only the strong correlations (5) but also the upper bound (7) on the correlations turns out be exactly what is predicted by quantum mechanics. More importantly, the above derivation reveals a crucial role played by the non-vanishing torsion in our physical space on the strength of the observed correlations. If the physical space in which the measurement events and are occurring has vanishing torsion, then the correlation between these events cannot be as strong as those predicted by quantum mechanics. But vanishing torsion is precisely what all derivations of Bell-CHSH inequality unwittingly assume (see, for example, the discussion in this paper). Note also that parallelizability of spaces by torsion is a topological concept. A toy example of how topology can strengthen the observed correlation can be found in the first appendix of this paper. Needless to say, the above discussion is merely a sketch of my disproof. In particular, I have glossed over the important issue of how errors propagate within a parallelized 3-sphere (a detailed statistical analysis of which can be found in this paper). Moreover, in my book I have shown that, not only the simple EPR-Bohm-type correlations, but ALL quantum correlations can be reproduced purely local-realistically in an analogous manner. For more general cases, however, the codomain of the measurement functions such as must be extended to the absolutely parallelized 7-sphere. Thus quantum correlations in general turn out to be nothing but classical, local, and deterministic correlations among the points of an octonionic 7-sphere. On the next page I discuss how the parallelizing torsion within such a 7-sphere is responsible for ALL quantum correlations. The argument I have presented above is experimentally testable. I have proposed a macroscopic experiment for this purpose. Further discussion about this experiment can be found on this page. algebra with operations lacking the closure property mathematical singularities partial functions logical inconsistency. A brief discussion of what he means by this sequence can be found on this page of his blog. Let me add to Paul’s observation that, not only Bell’s original 1964 proof, but *ALL* of the proofs of *ALL* of the Bell-type theorems, including the proofs of their variants and generalizations such as Hardy’s theorem or GHZ theorem, use only scalar algebra. Therefore all such no-go “proofs” are logically inconsistent (i.e., they are nonsense). Bell has been credited for discovering the mistake in von Neumann’s “no hidden variables” theorem even though both Einstein and Grete Hermann had discovered von Neumann’s mistake some 30 years before Bell did. Now Bell does have a nice and succinct explanation of von Neumann’s mistake in section 3 of the first chapter of his book. At the end of his section 3 Bell says something that is quite ironic in my view. How ironic! That is precisely the mistake Bell himself has made in his own famous theorem, as I have explained in section 4 of my Royal Society paper and in this preprint. I was just looking at this video on the Scientific American website about quantum entanglement presented on a blog by George Musser. I have to say that after understanding your model, I could immediately see where the argument for quantum entanglement breaks down in the video. I am wondering if anyone else reading this blog can point out those spots in the video? I remember on the FQXi blogs that George Musser noted to you that he would like to have a better discussion with you about your model. I think it is only fair that a counter opinion about quantum entanglement should be offered to SciAM readers and you should take George up on his offer. I watched the video. I must admit I am deeply disappointed and disturbed by how misleadingly the idea of entanglement is presented in the video. With all due respect to George Musser (who I think is a talented young journalist), what he is doing is no different from “spreading the good word” of entanglement. The video is misleading from the start. The two men set out to witness entanglement firsthand in a physics lab. But you can no more witness entanglement of a photon than you can witness phlogiston in a combustible body. All one can ever see in a lab are correlations between the supposedly entangled photons. No one has ever seen, or could ever see, entanglement directly. If we could, then all controversies over the interpretation of quantum mechanics would end instantly. To be sure, we can prepare various states of the photons as shown in the video—say, a state in which the correlations exhibited by the photons is no better than that produced by coin tosses, or a state in which the correlations exhibited by the photons which can be explained by the concept of entanglement. But the latter is not the only explanation possible for the observed correlations, as we know from the results of this paper. I show in this paper how the observed correlations can be explained without the notion of phlogiston… I mean entanglement. They can be explained simply as classical, deterministic correlations among the points of a parallelized 3-sphere. So it is very disappointing indeed that Scientific American would continue to “spread the good word” of entanglement without even mentioning the much less mystical alternative. The day will come, however, when the idea of entanglement would be no more in vogue than the idea of phlogiston. I appreciate your remarks and do hope to continue our discussions at some point. But I think you will admit that your views on entanglement are a minority opinion. Of course that doesn’t make them wrong! The history of science shows that minority opinions are often vindicated; all great truths are initially resisted. Nonetheless, Scientific American *has* to give higher weight to prevailing views — otherwise, the editors would be placing their own judgment above that of the majority of scientists, which is sometimes justified, but only in exceptional cases. To put it differently, once you convince your fellow physicists and philosophers of physics of your arguments, then you will have convinced us, too. Thanks for dropping by and responding to my comments. I do agree that my views on entanglement are a minority opinion at the moment, and I do appreciate why Scientific American has to give higher weight to the prevailing views. But it seems to me that your video linked above gives a wrong impression of entanglement even from the prevailing point of view. It is understood by most experts (say, by Lucien Hardy, for example) that all we can see in the lab are correlations, not entanglement itself. The latter concept provides a good explanation for the observed correlations, but that is a different matter. But again, I appreciate that you have a short time at your disposal in which you have to explain the essence of the idea to lay viewers, without getting into technicalities. As for my own views on entanglement, I do hope that someday my arguments are better understood by my fellow physicists and philosophers of physics. In any event—leaving your journalist hat aside—please feel free to continue the discussion we started during the last FQXi conference. I hope our world lines will intersect soon, so that we can continue our chat. Please let me know if you have plans to visit NYC. I’d like to expand on the phlogiston example you used. Shorly before Lavoisier showed that combustion is caused by rapid oxidation, there were theoretically two kinds of phlogiston, deduced from the evidence of combustion — “positive” phlogiston in the form of rust, which apparently added matter to a substance such as iron, and “negative” phlogiston which apparently subtracted matter from a substance such as wood, which was reduced to ashes. These conclusions are of course contradictory. The contradiction is of the same form [as certain mistaken claims about] your framework. Just as “phlogiston theorists” were mistaken about the true nature of combustion, so are these [claims] about the constructive nature of a continuous measurement process that obviates the identification of discrete outcomes with physically real, nonlocal results. Thank you for your comments. I did not know that there were two kinds of phlogiston. I am terribly sorry, however, because I had to edit out parts of your message. Names of certain individuals whom I cannot respect are not allowed on this blog. I hope you will understand. I have tried to preserve the integrity of your message as much as possible. As for the mistaken claims of those individuals you mention, it is important to note that equations (1.22) to (1.26) on page 10 of my book, as well as similar set of equations in this paper, have been explicitly verified (in great detail) by Lucien Hardy, Manfried Faber, and several other high profile and exceptionally competent physicists and mathematicians around the world. In fact, any competent reader with only basic skills in mathematics should be able to reproduce equations (1.22) to (1.26) of my book rather effortlessly. It is also worth noting that all of the so-called arguments against my disproof to date are based on an elementary logical fallacy—the Straw-man Fallacy. What they do is replace my argument (or model), say X, with a grossly distorted misrepresentation of it, say Y, and then pretend—by refuting their own distortion Y (by resorting to deliberate dishonesty or out of sheer incompetence)—that they have undermined my actual argument (or model) X. Such a dishonest strategy defies reason at its very core (for more details, see this paper). Unlike Bell himself, some of the followers of Bell are naïve, uninformed, and dishonest. The presence of positive and negative phlogiston is implied in the link you gave. The author just failed to point out the contradiction between two *physical* results from a theory that can accommodate only a singular physical outcome. 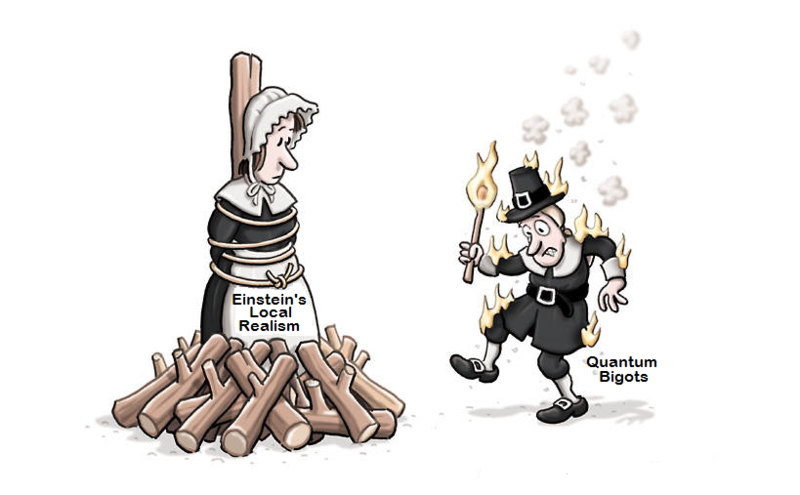 If phlogiston is assumed to be physically real, it must be causal, and if causal, attributable to only one result. It doesn’t do to say that in the one case phlogiston causes rust and in the other case, causes ashes. If rust and ashes have a common cause, it can’t be phlogiston. By the same token, non-vanishing topological torsion analogous to the rapid oxidation that causes both rust and ashes, informs us that continuous functions imply classical orientation entanglement — (and not the entanglement of real physical quantities whether we call the phenomena phlogiston or quantum entanglement) — that guarantees a unitary cause. In other words, if one assumes phlogiston, an experimental outcome of + 1 (rust) or – 1 (ashes) explains nothing. Both (contradictory) outcomes can’t result from the same physical cause. Your topological model, OTOH, has the same attributes as chemical oxidation in principle: a continuous process drives the measurement result from a deeper underlying physical cause of nondegenerate torsion. Einstein faced the same problem in explaining how spacetime is physically real (” … independent in its properties, having a physical effect but not influenced by physical conditions…”) because one does not think of continuous phenomena as physically real. One intuitively wants to ascribe “reality” to the measurement apparatus rather than the measurement process. Your critics are not subtle thinkers. They allow that 2 and 3 dimensional simulations are adequate for n-dimension phenomena. Thus, they reject *any* topological model out of hand; global results, as topology implies, have to be nonlocal by definition. I think that until one can grasp the analytical nature of your framework, it’s an uphill battle. Einstein had the advantage of large scale validation for continuous spacetime. Small scale classical experiments are tougher, less forgiving. Just as one has to accept a 4-dimension physical spacetime continuum for general relativity to make sense, one has to accept a parallelized physical 7-sphere for your framework to make sense. And just as Minkowski space-time requires a great deal of mathematical background to grasp, your framework requires that much more. You make some very good points. Sadly, as you put it, my “critics are not subtle thinkers”, to say the least. Moreover, dogmas, even within science, are not easy to overcome, as we have witnessed over the past few years. But thank you for your thoughtful remarks, especially concerning the phlogiston analogy. What you have is a nice demonstration of well known facts. It is well known (since 1970’s) that by reducing the efficiency of detection, to, say, 86%, one can reproduce the cosine correlation. Such a demonstration does not contradict Bell’s argument, and it does not have fundamental significance for physics. But, you are true , even if I haden’t yet seen theses formulae on sites or books. It is not so clear when you read QM curses or books on EPR to understand that the debate is not closed. How to start developping applications in such conditions ? Please, let me know where I could find the formulae known since 70 ? I found only the Maudlin scheme B ( it seems to my algo 9 without Markov and has a limit around 66.6 % pairs and not 63.6 as I read in some articles ) ? This is an amazing topic ! I had this paper in mind: Hidden-Variable Example Based upon Data Rejection, by P. Pearle, Physical Review D 2, 1418–25 (1970). I found your decorative blog. Checking ‘Internet’ it appears that you have been through some nasty ‘entanglements’ and have passed it in ‘local reality’, free and well, – with honour. Good luck for your further work! If you check your e-mail box for 03.03.2014, Re: Bell’s theorem, with two enclosed items, you will find the background for my contact. I would appreciate v.m. a reply and a comment to my paper. ( I can repeat the e-mail if you have lost it). Einstein was right when he did not agree with the EPR experiment conclusions and had said, “spooky action at a distance” cannot occur and that, “God does not play dice”. You are a diseased little turd swirling around the toilet drain en route to an obscurity even deeper than the one currently defining you. If your prophesy is right, then there is no reason for you to be concerned. As I understand (interpret) your theoretic conjectures, the problem arises from the interpretation of what a particle represents: QT versus your description – point vs 3D object (sphere), wave of probability with instantaneous communication between points in ST versus local ST with light speed limitation. I have always wondered how points in QT (Copenhagen Interpretation) can possess complex properties and give rise to complex interactions? QT begs for existence of hidden variables. Do waves of probability also govern virtual particles? And how could we unite the Copenhagen interpretation with your view? The answer could very well lay in an existence of a real De Broglie wave made of two sets of virtual photons (intersecting at opposite directions and at the speed of light) which express their circular polarization pattern only at a “point” at which the particle (the Higgs expression?) is located. Those photons would cancel to randomness in all other positions along their path of propagation, and shifting their frequency would lead to particle speed change. In this view matter would be a stable interference pattern. Particles would form as rain drops form in clouds and would exist intermittently pulsating to the beat frequency of the waves that build them. So, does this expression fit yours? We have finally launched the long-awaited website for the Einstein Centre for Local-Realistic Physics: http://einstein-physics.org/. I have posted a simplified version of my proposed macroscopic experiment to test Bell’s theorem here: http://libertesphilosophica.info/blog/wp-content/uploads/2016/05/PropExp1.pdf. Joy, I am reminded of Robert Jay Lifton’s book on ideological totalism, especially chapter 22 where it talks about the demand for purity. A hilarious video mocks cult behavior with a scene where the indoctrinated mob repeatedly chants “stamp out doubt.” Frankly, these people couldn’t connect Back to the Future to The Walk (lol) but I digress… The problem I have with criticism of your work is that it’s religious in nature and the people conducting the criticism are frankly not qualified enough to be passing judgment. For such a prominent issue, we need prominent referees, especially given the novel math employed. Journals are a joke these days, so I don’t accept their vetting on such a novel argument. The reproducibility crises reveals they are in a massive credibility meltdown and can’t be trusted in an age of hyperspecialism and information overload. What surprises me is that the actual physics community has been afraid to directly engage you. Getting a self-righteous statistician in the Netherlands to do it for them is quite cowardly and comical, even if he’s right. Vicious blog trolls like Luboš Motl (long disgraced from the physics community) just copy-and-paste criticism and confess ignorance of geometric algebra, as did Gill. This is the same community that endorses the multiverse, SUSY, unprovable black hole theories, quantum computers and non-empirical string theory and E8 speculations. The entire profession is becoming an inside make-work joke. In my opinion, it’s a funding bubble that never got popped since WWII but I digress again… QM just gives expectations of observables and probability is merely an interpretation (the Born rule is “metaphysical fluff”). Amplitudes interfere and not probabilities (the wave function can be positive, negative, complex, spinor, or vector ), so I think quantum computers do not even follow directly from QM but those like Aaronson refuse to acknowledge any doubt. 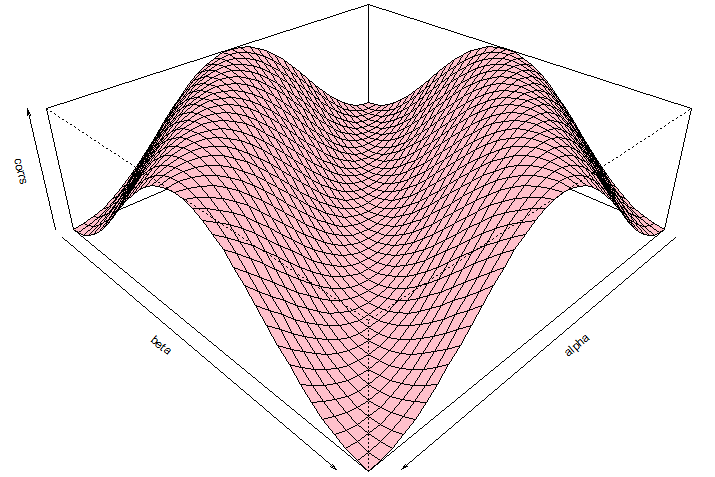 I admit that there is no reason to conclude that quanta must necessarily be reducible to traditional math at all because the map is not the territory but I digress again… A very clear and basic explanation of the reason why Bell’s theorem doesn’t imply non-locality has just been published and two points can be made immediately from the paper: measurements are not predetermined or (second hidden conclusion) traditional math can’t model quanta and QM is incomplete. In other words, one can reject a naive version of “realism” to get rid non-locality. What is really nice about this paper is that it can be read by just about anyone. Your serious error is the error of arrogant academia in general, which is a lack of self-contained explanations. Take someone from a high school linear algebra, calculus and physics background to the endpoint of your argument without skipping steps. Clarity is key. You spend more time answer trolls than explaining things to the rest of us. It would be time better spent! Many thanks for your comments. I agree with much of what you have written. It is indeed true that I have spent too much time answering ignorant and self-righteous trolls like Gill. So, finally, some well-qualified people had a chance to look at my argument closely and have approved the publication of my latest paper, in a prominent journal. Seeing you wrestle with Gill reminded me of the fight scene from John Carpenter’s They Live (ROFL!). While your argument against Bell is about topological incompleteness, Marian Kupczynski has a different approach to give a local realist account: “The oversimplification made by Bell was the assumption that Λxy= Λ =Λ1 x Λ2 what is equivalent to assuming that the correlations in different incompatible experiments may be deduced from a joint probability distribution on some unique probability space Λ.” Rather simple. 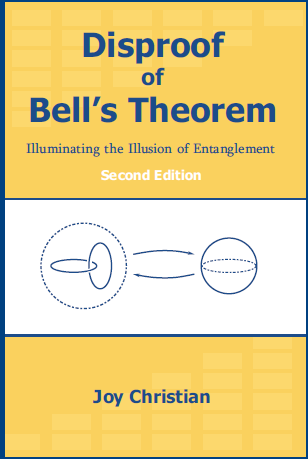 I was always skeptical about a hyper-generality of Bell’s theorem because problems of reality are so open-ended. People should be jumping up and down with “joy” to see their way beyond Bell. I agree with the argument that “The oversimplification made by Bell was the assumption that Λ = Λ1 x Λ2, which is equivalent to assuming that the correlations in different incompatible experiments may be deduced from a joint probability distribution on some unique probability space Λ.” The philosopher Arthur Fine pointed this out many decades ago. And yet the mainstream Bell community has been ignoring this obvious weakness in Bell’s argument. They do not seem to understand the simple logic that if you put garbage in a theorem, then all you can expect to get out of it is also garbage.